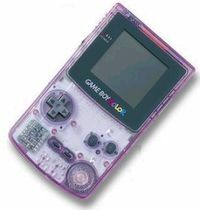 The Game Boy Color, or GBC, is a handheld console made by Nintendo. It is essentially a Game Boy Classic, except with the much needed capability of showing color, it is also slightly smaller in size, and a fair bit lighter than the classic. This page was last modified on 18 September 2010, at 17:16.